The #35th Gathering of Mountain Eagles will be conducted from 3 April – 6 April 2019. 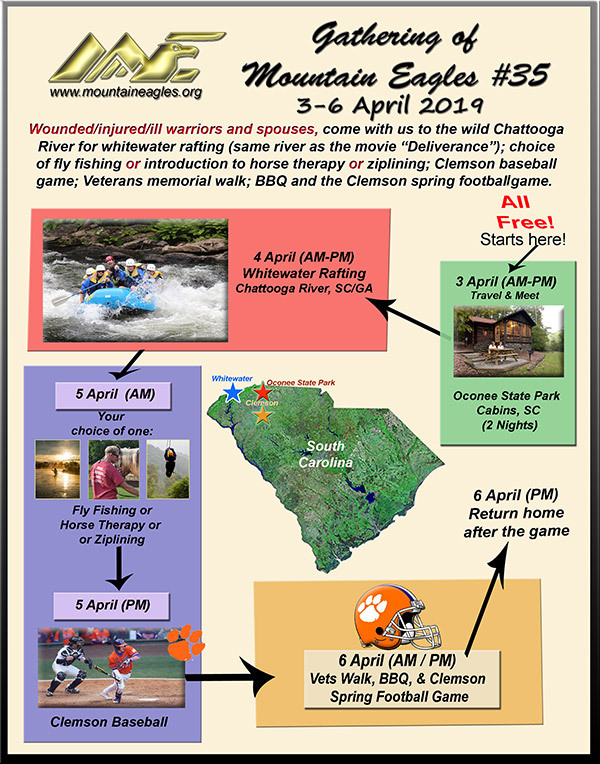 Gathering of Mountain Eagles will be conducting our 35th event from 3-6 April 2019 in the upstate of South Carolina. For those interested, please go online and fill out the form at http://mountaineagles.org/gme-application-form/ to apply. As there are three events early on Friday, 5 April, you need to rank order choices based on your interests. So, on the bottom of the application form, please indicate your 1st, 2nd and 3rd preferences for equine therapy, fly fishing and ziplining. I will try to accommodate everyone, but based on our required commitment of minimum numbers for each activity, that may not always be possible. As always, new veterans have priority for attendance, but we have very rarely turned applicants down, especially if you can wait until the last week or two. We hope you can come with us and have a great time in beautiful mountains of South Carolina! Please pass this onto other wounded/injured/disables veterans and their spouses who might be interested. Thanks! To provide opportunities for wounded or injured American military service members and spouses, to enjoy the therapeutic effects of adventure activities and relaxation opportunities primarily within the states of West Virginia, Pennsylvania and Virginia. Secondarily, to provide opportunities to thank the warriors, enhance public awareness and increase aid for all programs supporting wounded and injured Americans and their spouses. Gathering of Mountain Eagles is a tax exempt, 501(c)(3) non-profit organization.